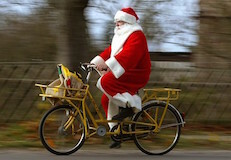 HO HO HO In the spirit of Christmas in July we will tinsel up our trusted steeds and ride to Williamstown. First we will admire the pink lake in Westgate park. The journey will carry on the westgate punt across the waters from Westgate Landing in Port Melbourne to Spotswood Jetty. Meandering on to Williamstown just st to push our pedals a little further to marvel at the wonder of the Timeball Tower/Light House . Cafe stop to sing jingle bells and sip hot chocolate on the way . Then it is back to St Kilda . What to bring or do : $7 fare for the punt / pocket money for coffee or hot chocolate / singing voice for carols. Optional: tinsel up your bike, come in festive fun dress up. It is a good idea prior to the ride to check your tyres are well aired and the brakes are working properly.